I don’t actually drink coffee so this was more of a hot chocolate and muffin break with some gossip thrown in as well of course. It can be hard in France I have found to find a nice coffee shop with a sort of Starbucks or Costa feel that does good hot drinks, food and some amazing sweet treats. When we discovered this cafe ‘Cafe Columbus’ in the centre of town it was a godsend. We have spent many a afternoon in there just chatting over a nice hot chocolate that my loyalty card is almost full and I am on my way to a free muffin. It is nice to just take some time out from college work and just have a gossip with friends and this cafe gives us the perfect opportunity to do this. Along with lovely hot chocolate this cafe does AMAZING muffins and yes they are that good that I had to capitalise it! They have a whole range from chocolate chip to red fruits to nutella filled muffins and they are all freshly made in store each day and throughout the day as needed. This means that they are gorgeous and I could probably eat one everyday but I don’t think that would do my health any good. 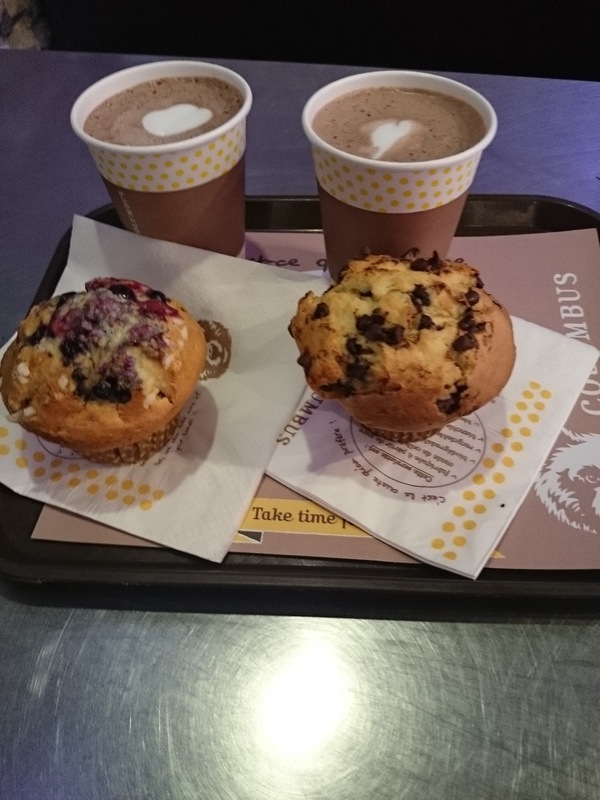 Muffins and hot drinks are not the only things you can get but they also make lovely smoothies and do a selection of paninis, bagels and rolls. All delicious of course. They also have free Wi-Fi so if you want to take an Instagram or tweet about your food you can or you could do some work if you wanted but lets be honest that’s not as fun. I can’t wait to work my way through the menu of muffins and sandwiches . If you are ever in Rennes I would recommend popping into Cafe Columbus for a treat.